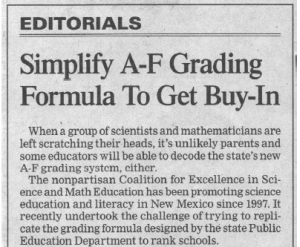 The Albuquerque Journal published an editorial on August 4th, titled "Simplify A-F Grading Formula To Get Buy-In." CESE is mentioned prominently! 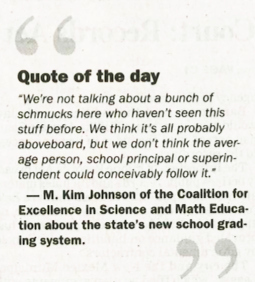 When a group of scientists and mathematicians are left scratching their heads, it’s unlikely parents and some educators will be able to decode the state’s new A-F grading system, either. The nonpartisan Coalition for Excellence in Science and Math Education has been promoting science education and literacy in New Mexico since 1997. It recently undertook the challenge of trying to replicate the grading formula designed by the state Public Education Department to rank schools. It couldn’t, partly because it didn’t have all of the data the PED used, but the group concluded the formula is too complex, adds together incompatible elements and is so sensitive to small changes that unreasonable grade swings from one year to the next can result. Please, click through and read the entire editorial.